BlackRock, Vanguard, Fidelity and American Funds, just to name a few, have considerable stakes in most US companies. The managers of these funds are supposed to exercise their vote in the interest of the ultimate investor. But do they? When it comes to environmental proposals, for example, most of these asset managers nearly always vote against. Why? Should we assume that all investors—even socially responsible endowments—do not care about the environment? In the past five years, there has been increased attention on the voting behavior of asset managers—not only theoretically, but also empirically. 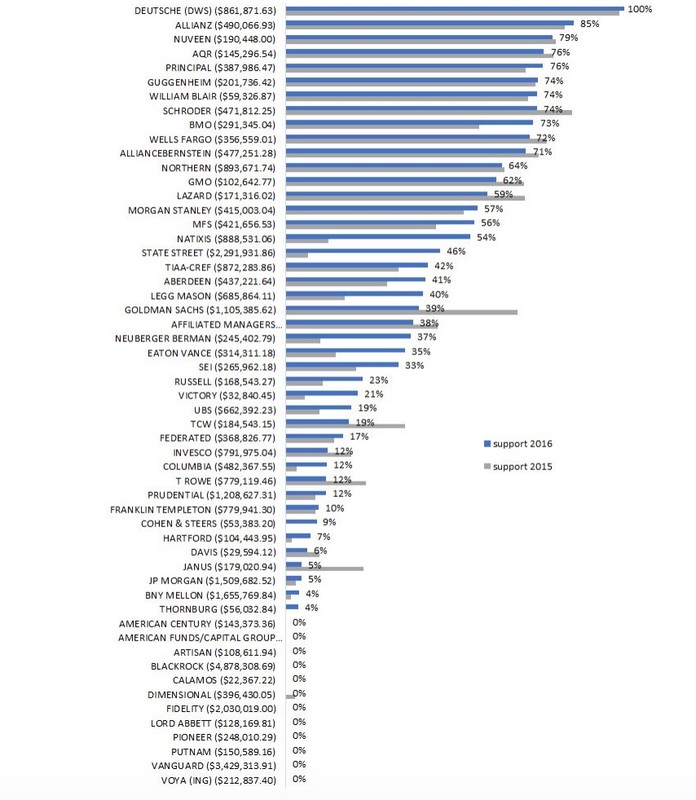 The table below was created in 2016 by Ceres (a non-profit sustainability advocacy organization based in Boston) and details votes cast by asset managers on climate-related proposals. 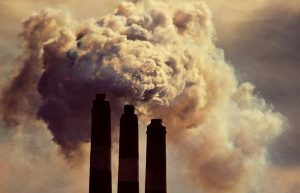 These proposals often ask companies either to disclose certain environmental activities, such as their emissions, or to provide information on how the company will contribute to the globally-agreed 2 degree scenario. In 2017, 90 climate-related proposals went to a vote at company meetings. While some asset managers voted in favor of almost all proposals (e.g., DWS and Allianz) others did not vote in favor of any (e.g., American Century, Cohen & Steers, Lord Abbett, Pioneer, and Putnam). Interestingly, BlackRock, Vanguard, Fidelity, and American Funds all voted in favor of a climate-related proposal for the first time. This development was deemed an important stepping stone because these four asset managers collectively own large stakes in many companies, and therefore their votes can have significant effects on corporate behavior (Ceres, 2017). It’s not just the climate. 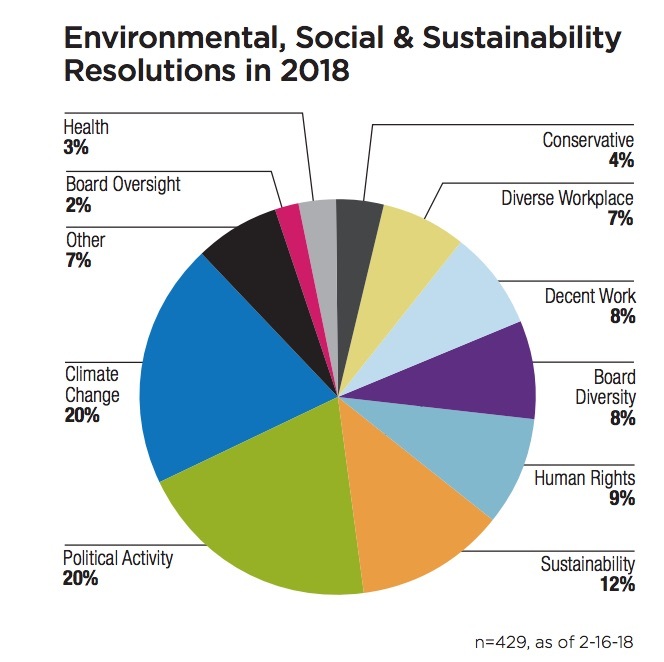 In 2018, proponents filed at least 429 shareholder resolutions on various environmental, social, and sustainability issues. These included proposals on gun violence, sexual misconduct, workplace diversity, student loans, political activities, and the opioid epidemic (ProxyPreview, 2018). Financial institutions have been receiving significant pressure from the public. In the past decade, for instance, banks have been targeted continuously for their involvement in environmentally destructive projects. In February 2017, 700,000 people petitioned their banks to stop financing the Dakota Access Pipeline. In December 2018, 30,000 account holders petitioned Barclays to stop investing in oil pipelines from tar sands, dubbed the “dirtiest fuel on the planet.” Events like these have caused significant deposit losses and have encouraged operational changes in bank behavior (Homanen, 2018). Overall, bank-specific campaigns are increasing both in size and in number and show no signs of slowing down. “Vanguard’s voting record on political spending and lobbying disclosure proposals is abysmal. It almost always votes against or abstains from voting for these proposals. A recent Public Citizen report found that if Vanguard alone had changed its voting in 2016 to support the political spending disclosure proposals, overall support for the proposals would have increased 2.48 to 13.68 percentage points and proposals at NextEra Energy Inc. and NRG Energy Inc. would have reached majority support. Considering the number of people who signed the petition, one may wonder how long Vanguard can keep ignoring these demands. Vanguard is not the only one facing public pressure. BlackRock CEO Larry Fink, reported the Financial Times, has been challenged by responsible investment campaigners to act more forcefully on climate change. BlackRock has recently been identified as the world’s largest investor in coal plant developers, holding shares and bonds in value of $11 billion in 56 coal plant developers across the world. There are now active campaigns against BlackRock and their involvement in environmentally destructive projects. While there is currently little public attention on Blackrock’s proxy voting behavior, it would not be hard to imagine such scrutiny developing over time. Asset managers have a fiduciary duty to represent the interests of their clients. If client interests change, stewardship practices (e.g., voting behavior) should change as well. But is the voting behavior of asset managers like BlackRock and Vanguard truly indicative of their clients’ interests? And if not, will it change? Change is in fact already taking place. Retail demand for socially responsible investments is growing, and asset managers are responding to this new changing landscape (Bauer, Ruof & Smeets, 2018; Flammer, 2015; Hartzmark & Sussman, 2018). These institutions are creating numerous socially responsible investment products for their clients, such as ESG funds (i.e., portfolio investments that integrate environmental, social and governance factors into the investment process) and impact investments. As a consequence, the number of socially responsible ETFs has nearly tripled in the past three years, bringing the total number of such funds to 78, with assets under management well in excess of $7 billion (LeDonne & Khan, 2018). As clients are increasingly demanding more socially responsible investment products, asset managers are reacting by increasing the supply. Clearly, the “asset” side of “asset management” is changing, but can the “management” side be changed as well? And if yes, what would we need to do to encourage such a change? Some argue that the asset management industry is too “opaque and confusing” for the public to understand and public pressure will never reach the level that it has against banks. Certainly, the complexity of these institutions may shield them from public scrutiny. However, even pension funds have been targeted for their socially undesirable investments (e.g., financing of cluster bombs), which ultimately led them to change their investment strategies. Surely, asset managers could face this type of criticism as well. Asset managers like Vanguard and BlackRock provide countless fund-based financial products, and if you care about how your fund votes on societally relevant issues, switching is not difficult. If clients switch funds, asset managers lose business, which ultimately forces them to listen. The same way banks lose depositors and pension funds lose pensioners, asset managers will lose their main source of revenue: the clients. Can or will the proxy voting behavior of asset managers change? In the United States, under rules issued by the SEC, funds are required to provide a record called an “N-PX” report that shows how of how they voted; and if retail investors care about voting outcomes, they can search for this information. However, relying on a few proactive investors is not always an efficient way to scale up change. Could we reach a stage that goes beyond small scale individual activism, but which also does not necessitate a large public protest or petition? In 2016, Morningstar (a global investment research company) began assigning fund-level sustainability ratings that were based on the sustainability performance of the fund’s underlying portfolio companies, and researchers found out that capital flows were significantly reactive to these scores (Hartzmark & Sussman, 2018). In other words, “bad ESG funds” lost customers. Imagine what would happen if Morningstar began providing ESG scores on fund stewardship practices, like voting behavior? This day might not be too far away. In 2018, Morningstar acquired FundVotes, a company specializing in fund-level ESG proxy voting data, suggesting that Morningstar might soon be evaluating funds based on their voting practices. Armed with this new possibility, it would become significantly easier for clients to actively judge funds and, once again, make their vote count. Ceres (2018). The Hidden Story of Climate Proposals in the 2018 Proxy Season. Ceres (2017). Four Mutual Fund Giants Begin to Address Climate Change Risks in Proxy Votes: How About Your Funds? Ceres (2017). Is Your Mutual Fund Company Taking Climate Change Seriously? Ceres (2016). Is Your Mutual Fund a Climate Change Denier or Climate Champion? Flammer, C. (2015). 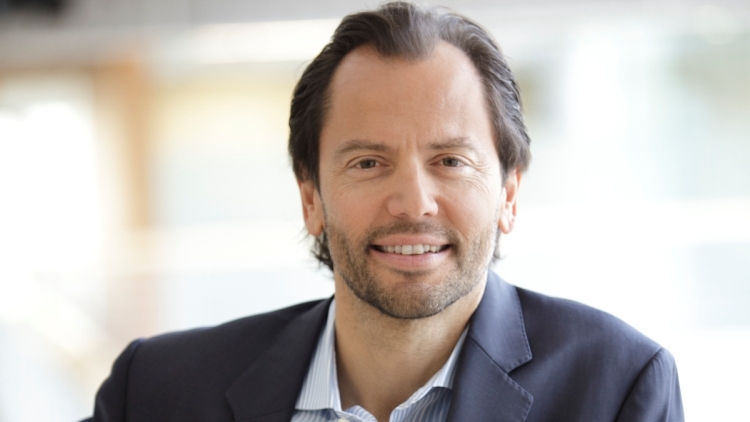 Does corporate social responsibility lead to superior financial performance? A regression discontinuity approach. Management Science, 61(11), 2549-2568. Hartzmark, S. M., & Sussman, A. B. (2018). Do Investors Value Sustainability? A Natural Experiment Examining Ranking and Fund Flows. Working Paper. Homanen, M. (2018). Depositors Disciplining Banks: The Impact of Scandals. Stigler Center Working Paper Series. LeDonne, G. & Khan, E. (2018). Socially responsible ETFs more than triple in years since Paris climate deal. S&P Global Market Intelligence. Shirley W. (2018). Surprises from the 2018 Proxy Season. Harvard Law School Forum on Corporate Governance and Financial Regulation.